WW1 Reenactments Equipment : Great War Tommy WW1 Documents, Paperwork : Trench Orders booklet, 1918. WW1 Reproductions and WW1 Reenactors Equipment / Kit - Trench Orders booklet, 1918. 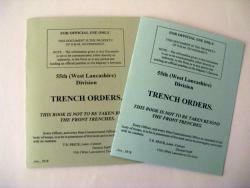 27-page, 8" x 6", facsimile of Trench Orders (Jan' 1918) of the 55th Division. "This book is not to be taken beyond the front trenches". Contains instructions of 32 different aspects of Front-line trench procedure. Fascinating!